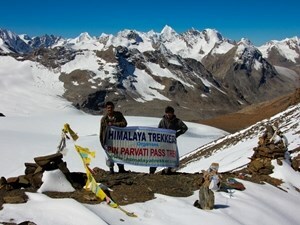 Pin Parvati Pass trek is indeed one of the most glamourous trans Himalayan trek. 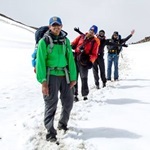 This difficult and strenuous trail is ONLY for the experienced and physically active hikers who have been to high Himalayan multi day camping treks at least in 3/4 occasions, if not more. 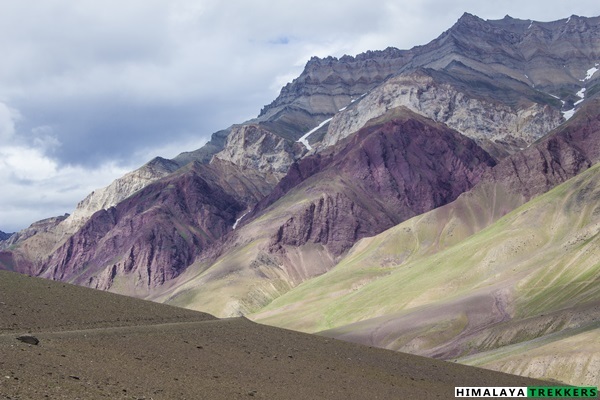 The trans Himalayan valleys of Spiti were once difficult to gain access to, but the route through Pin Parvati pass halves the distance between the Kullu and Spiti valleys. The route is opened to trekkers in 1993. This always snow bound pass unfurls the stark contrast between barren and rain shed Pin valley (Spiti side) to that of lush green Parvati valley (Kullu side). Trekking through this trail of a lifetime, one can see dense forests, hot springs, grazing pastures, meandering streams, moraines and glaciers, snow capped peaks, coloured mountains and many more. 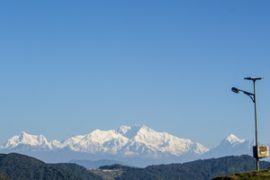 The major peaks seen are Kullu Eiger, Parvati South, Kangla Tarbo, Kullu Makalu & West Horn. 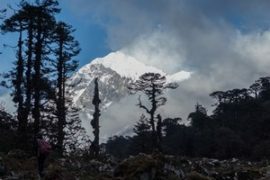 The trail runs through the Pin Valley National Park, known for sighting of the snow leopards and the Great Himalayan National Park with many rare Himalayan birds like the Western Tragopan. 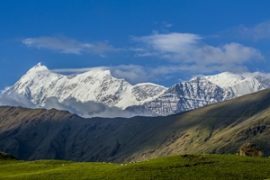 Though the trek is strenuous and challenging, the beauty of the region, makes it one of the most sought after Trans-Himalayan trek. 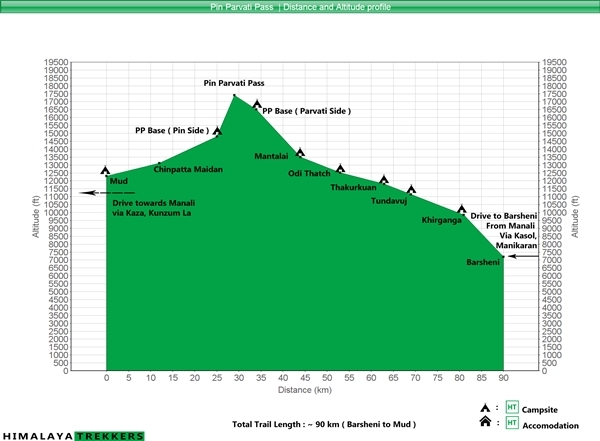 The below graph will give you a pictorial representation of various campsites and and their distances in between and general gradient/altitude profile. Why Pin Parvati Pass trek with HT? 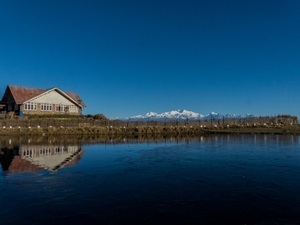 There are few reliable tour operators who can safely create a passage between Pin and Parvati valley. We have been operating on this trail from 2011, when there were hardly any companies to take up this challenge. This is not a trail where any operator can run batch after batches but to carefully select the best time to organise. Selecting the appropriate weather window is the key and should be given highest priority. However often this is not the case but when a company’s logistics is free to manage! 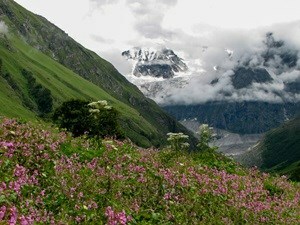 More portion of the trail to Pin Parvati pass trek is along Parvati valley where monsoon is adequate. So this trail should be avoided starting from later half of July to a month’s tenure till late August. Also our itinerary is carefully made that you get proper acclimatisation chance, yet its a day shorter while descending. As of now all of our groups have successfully completed this trek, be it in pre monsoon or in post monsoon, following our itinerary. So our years of experience in running this route along with most reliable local guide should be the solid reason to choose us. Also please note that we don’t send send a Trek Leader to any of our treks, but best in class support and local trekking guide(s) selectively chosen for the trek. Like any other high altitude season this trail has also two windows where your chances are more to get clearer and safer weather. Pre-monsoon/Summer: From third week of June to a one month span. Best would be around 20th June to 20th July. Earlier you start, chances of snow from lower altitude, probably in and around Mantalai lake and above. Post monsoon/Fall: September to mid of October. Mid of October can be really cold, specially in Spiti side. Also the chances of fresh snowfall increases in October. There are quite a few challenges involved on this trail. 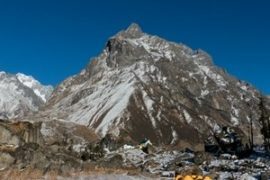 Apart from your prior high altitude trekking experiences, you need to have high level of physical and mental fitness to complete this difficult and strenuous trek. 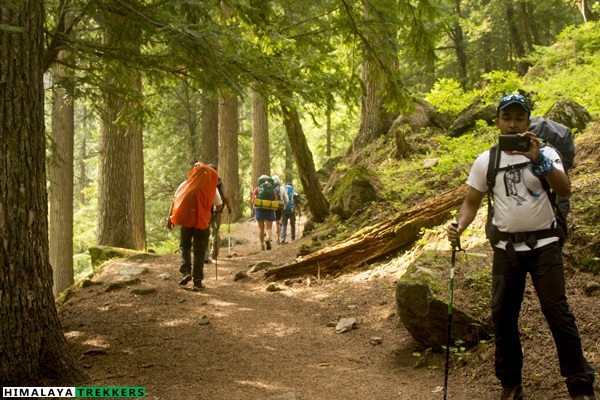 It covers around 90 Km of trail and rucksack offloading is NOT allowed on this trek. This means you need to carry all your personal belongings along with the sleeping bag (which we will provide or you can bring your personal one) in your rucksack throughout the trek. This ensures you are safer on trail in case of any unwanted situation or in case you are benighted. 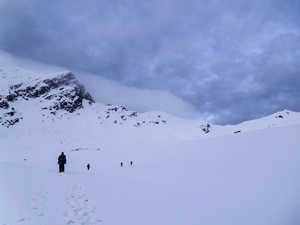 The trail comprises boulder and moraine stretches, icy cold river crossings and crevasse filled glacier round the pass. There are tricky sections on the trail with potential exposures. There are two natural boulder on river (one being on the Parvati river named Pandu Pul/bridge, and the other one on a side stream called as Chhota Pandu Pul) where you need to cross without any rope. There are ample friction on the rock, but you need to headstrong and must not panic. 1) From Delhi (Kashmiri Gate ISBT) the Volvo and regular buses start in the afternoon and evening. It takes up to 15 hours to cover the distance of 560 Km. HP Government transport operated HRTC (http://hrtchp.com) and Tourism Department HPTDC operated busses are reliable and runs on time. There are privately operated bus services also having different pick up points in Delhi. You will get busses starting from late afternoon to 10 pm in the night. 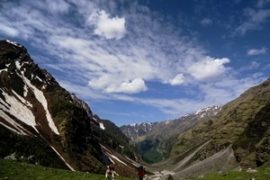 Duration: 9 days of trek; Manali to Manali in 11 days. Prerequisite: At least 2 Moderate grade prior Himalayan treks experience of around ~ 4500 m/14760 ft or above. Highest Point: Pin Parvati Pass ~ 5300 m/17400 ft. Seasons: mid June to mid October (expect a month from Mid July to mid August). Further Option: Combine Bhaba Pass trail to connect with Kinnaur. Trekkers need to reach Manali on Day 1 by noon. Return to Manali on Day 11 evening (around 7 pm). Arrange your tickets for inward journey and return accordingly. Access to Manali (The trek base): Depending upon the trek members we can arrange a pickup and drop from Chandigarh to Manali (320 Km) and back. However there is a wide choices of bus, starting from regular, luxury and Volvo operated by both Govt. and private agencies from New Delhi and Chandigarh to Manali. Reach Manali (~ 1950 m/6400 ft) by noon/afternoon. Our guest house will be either at Vashisht, which is 3 Km further up from Manali town. Vashisht has a temple and is famous for its hot spring inside the temple. In the after take a walk towards Jogini falls (Vashisht). Accommodation in lodge/guest house. Pickup from Manali in the early morning and reach Barsheni (~ 2200 m, 7200 ft) via Kasol and Manikaran by car. Distance is around 110 km and can take around 4 hours. Trek starts from here. The trail ahead is a 9 Km walk through a lovely forest to the open meadow of Khirganga (~ 2920 m, 9580 ft). According to the myth, this is the hot spring where Lord Shiva meditated. One can take a refreshing bath in the spring. The climb will take around 5 hr. Overnight in tent. The 12 Km walk to Tundabhuj (~3400 m, 11150 ft) is very enjoyable while we again follow the Parvati river valley. Gently ups and downs, passing through the lovely grazing grounds and the stretches of montane conifer forest gives the flavour of a classy Himalayan trail. Occasionally the river is seen on our left. Camping ground is situated in the fringe of the birch forest. The Parvati river ramble in the gorge to our left while we camp on the true left of Parvati. A sheer rock wall jutting on the opposite side of the river having five distinct spikes. According to legend these are the five Pandav and called Pandu Shilla. We camp for the night. Today is a short trek to Thakurkuan (~3600 m, 11800 ft). We follow the course of the river. After a while the trail becomes difficult and we walk on a narrow rocky trail. The wooden bridge to cross the river is washed off in 2014 and since then the trail till Thakurkuan follows along the true left of Parvati. Earlier we had to cross the river once more over a hand drawn Pulley Bridge which is no longer required. After continuing for 2 Km or so a wide vista opens up. The panorama offers a plethora of wild flowers, iris and poppies to name a few. We camp on the valley for the day.Distance is 6 Km and may take 3 to 4 hours. We continue our days trek along the river. After a while we cross a side stream over a boulder. This is referred as Chhota Pandu pool and the traverse on the rock is exposed to the stream itself running some 30 feet underneath. After that we cross the main river over a huge boulder spanning Parvati river. This is a marvel of local engineering and called Pandu Pool. From now onward the river is on our right and we will remain in the true right of the river. A climb starts immediately after crossing the bridge and continues for an hour. We turn left once we reach the shoulder of the mountain and continue gently on a wide alpine meadow. The campsite of Odi Thatch is at the end of this meadow. This is a pastoral ground and shepherds start going down denoting the beginning of fall season. Kullu Eiger (~ 5650 m/18530 ft) peak stands inviting with its 2000 m/6500 ft rock buttress for the rock climbers. We camp beside the river. Distance is 10 Km and may take 5/6 hours. 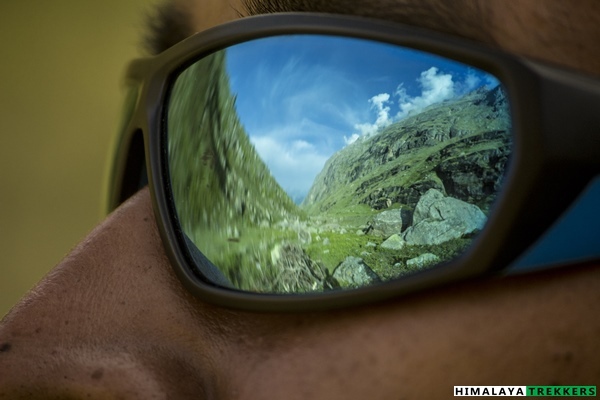 Today we trek to Mantalai (~4100 m/13500 ft), considered to be the origin of Parvati River. At the beginning the trail is gradual along the river and then the valley widens as well the water flow. A marsh land spans a kilometre or so due to the shallow flow of the river. The area is called Chhota Mantalai. One can spot a rock wall at a distance across the the river. We leave behind the vegetation and suddenly enter into the glacial moraine and debris. The snout of the glacier is clearly visible. We follow and climb a moraine ridge that dams the Mantalai Lake. From top of this ridge the vast area of Mantalai amazes any tired trekker. A temple along with cairns and flags welcome s us. We find a suitable spot for camp. This area is also a marshland in the middle of the valley. Distance around 9 Km and may take 5/6 hours. Today is a long & tough day. Start early from the camp and we move along the valley after crossing a side stream. We keep left as we climb a steep and steady ridge. This is indeed a tough section. At the end of the climb we turn left and enter into a rock and boulder zone. We encircle the zone over boulders. Another bone chilling stream just gushing out of the glacier awaits for us to cross. One final climb on a rocky ridge takes us to the beginning of the glacier. This is the glacier which comes from the watershed of Parvati pass. 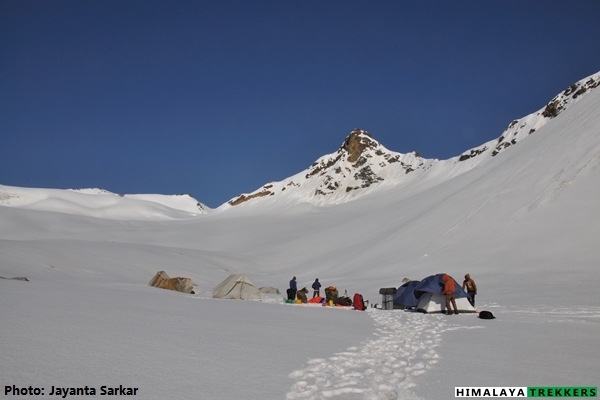 We camp at the edge of the glacier for the Parvati side base camp (~5000 m, 16500 ft). Distance is 10 Km and may take up to 8 hours. Today again we start early morning across the huge open ice field leading to the pass in the east, which can be reached in 4 hr. We need to negotiate the crevasses and hard icy slopes carefully. While walking on the permafrost region we see the glacial lake formation and snow capped peaks. There are few crevasses on the glacier which is to be negotiated. 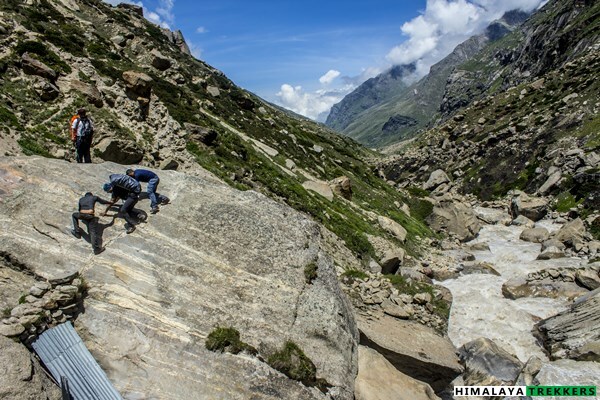 To reach the Pin Parvati Pass (~5300 m/17400 ft) we climb a steep rocky ridge and the last stretch.. 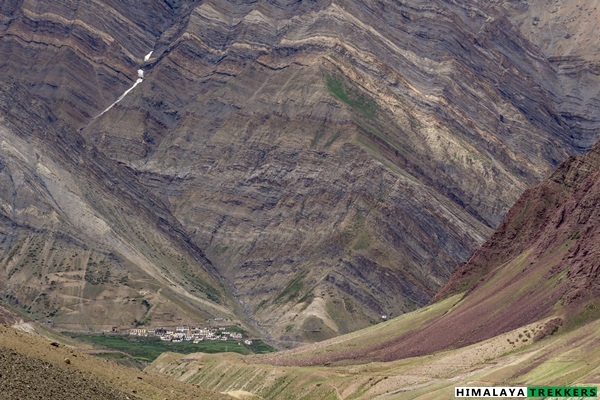 The pass offers a wide panorama of peaks and the valleys of Spiti. We descent from the pass, first on snow and ice and then on steep loose scree. 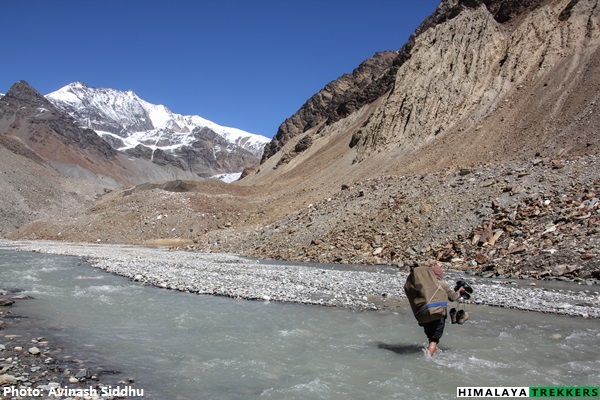 Finally we cross an ice cold wide open stream and reach the camp at Pin side base camp (~4500 m, 14800 ft). It is a patch of grass on the left bank of the Pin River. Distance around 9 km in total which may take up to 8 hr. From today onward the valley is typically Spitian, barren, but with patches of grass and scree. Start early in the morning and we follow the left bank of Pin River (as we stay on the true left of the river) to descent gradually. We reach Chinpatta Maidan (~4000 m/13120 ft) around a distance of 13 Km. One can see the route leading towards the Bhaba Pass for Kinnaur on the other side of the river. From here scenically proliferation of the coloured mountains mesmerises you as the Pin valley broadens up. The trail gently descends along the left bank of the river and reaches Mud (~3750 m, 12300 ft), the first village on the Pin valley is another 12 Km. Total trekking will take around 10/11 hours.We camp for the night. [Note: If we reach Mud early in the evening then we may proceed to Kaza depending upon the availability of a vehicle]. Final day of the trip as we take the road back to Manali via Kaza, Lohsar, Kunzum La to Chhatru and then finally To Manali over Rohtang Pass. Trip ends here. This is an additionally day which is absolutely required for a long and difficult trek. We will use this day as a buffer day due to weather conditions or in case a rest day at Mantalai. One night accommodation at Vashisht village, Manali (Day 1) on twin sharing basis. Meals on your own. Car drop from Manali to the trek starting point Barsheni. All meals during the trek (Day 2 lunch to Day 10 dinner). Regular Indian style nutritious vegetarian food during the trek (including occasional eggs), breakfast packed/hot lunch (depending upon the time you reach a campsite), snacks, dinner along with coffee/tea/soup. Any permit fee, camping charges, Forest levy required for the trek. Car drop from Mud to Kaza. One night stay at Mud or Kaza (Day 10) on sharing basis and dinner. Travel and Medical insurance policy (covering illness, AMS, evacuation, accidents etc) covering high altitude trekking and mountaineering up to 6500 m. (For Indian nationals it is included in the TREK FEE, up to 60 years of age). It covers your trek as well as your your travel for a maximum duration of 15 days. Food during your stay at Vashisht, Manali (Day 1 and Day 2 breakfast). Variety of options are available ranging from Indian, Chinese, and Continental with choice of Veg & Non Veg food. Transportation back from Kaza to Manali. Cost of buffer day. If it is utilised during trek, an additional ₹ 3000 per person will be collected on spot. Note: You need to carry your own backpack along with all your personal belongings and the sleeping bag (provided by HT or your personal one). 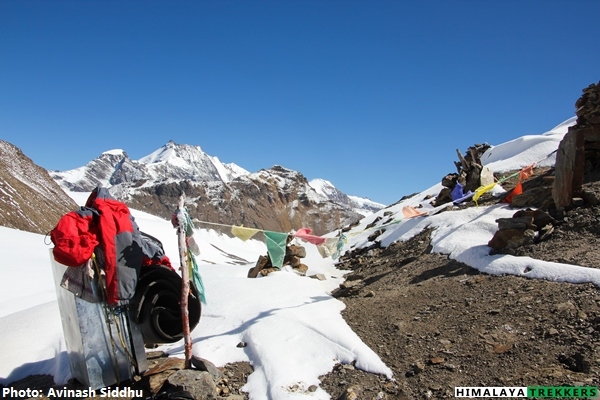 This is mandatory for a difficult trek and is aiming to the safety of the trekkers. 10 of us went on the Pin-Parvati trek with Himalaya Trekkers in August 2016. 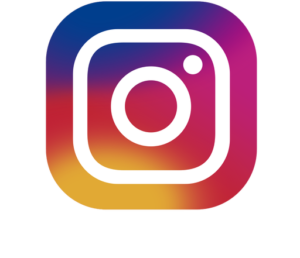 From the time we made contact with them, with respect to enquiries and other matters, Himalaya Trekkers were thorough professionals in dealing with it. 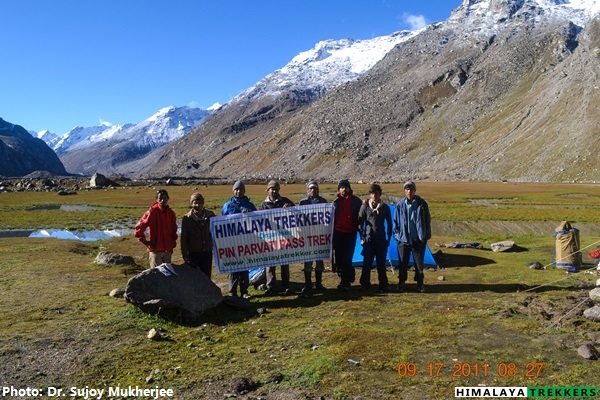 As 3 members of our group were trekking for the first time, that too a high altitude trek, Sapta of Himalaya Trekers made it a point that he speaks to them personally and guide them about training for the trek. He didn’t discourage them from doing the trek, something other organizers had told me. Instead, he emphasized on working as a group during the trek, which worked wonders for everyone. The staff provided by them was top-notch, from the cook, guide to the porters. All went out of their way to help anyone and were every-ready to provide us with information about the surroundings. 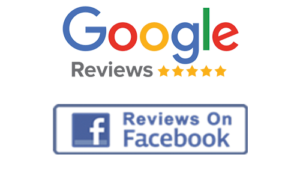 Once we completed our trek, they were eager for our feedback and have been asking us regularly (an area where most of us slacked off – reason for my late review). All in all, a splendid experience with them and I would definitely recommend them to all.